This volume brings together thirty collected essays by different authors that were earlier published by BPS as the treasured Bodhi Leaves series. The Bodhi Leaves were originally published as a series of smaller booklets, hand-sized, between 16 and 40 pages in length. Their range of topics vary, and the tone is less expository and more conversational. Bodhi Leaves are intended to offer personal insights into the Buddha’s teachings, close-up focus on specific ethical and social problems, and practical guidelines to living by the light of the Dhamma. 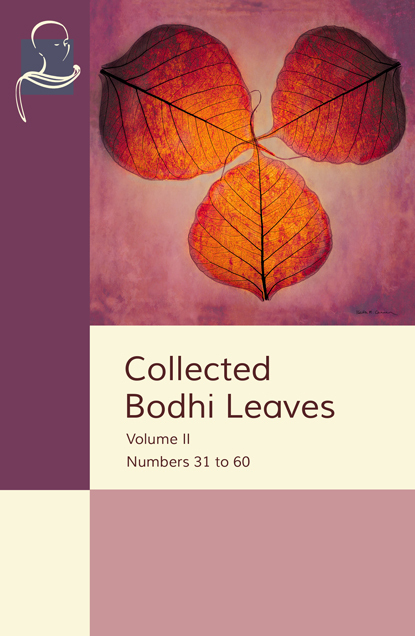 This series was discontinued some years ago, but the texts are now available in this five volume series of Collected Bodhi Leaves. Excellent, How nice to have this series in an attractive bound volumes. Well done, Pariyatti.